This week's heavy fighting between the Lebanese army and a shadowy radical Islamist group is adding a new flashpoint to a region in crisis. Fatah al-Islam - a small group said to number no more than a few hundred fighters - might not sound like a serious threat to the Middle East. But the nature and timing of the challenge posed by the group mean it is more than just a Lebanese problem. To be sure, the origins of the three days of fighting seem to have been local. Four gunmen of Fatah al-Islam robbed a bank near the northern city of Tripoli and made off with $125,000 ($63,000). The next day, when the Lebanese security forces tried to arrest the suspects, they were met with a hail of bullets from the Tripoli apartment where they had sought refuge. From there the fighting spread to the nearby Palestinian refugee camp of Nahr al-Bared which the group had made its base. Fatah al-Islam, small though it is, has shown it can cause serious trouble for the weak and beleaguered Lebanese government of Fouad Siniora. No sooner had last summer's war between Israel and Hezbollah ended, Lebanon was plunged into political turmoil. A powerful Syrian-backed opposition movement threw down a direct challenge to the legitimacy of Mr Siniora's anti-Syrian, Western-backed government. The government regards Fatah al-Islam as an instrument of Syrian intelligence. It believes the timing of the current crisis is linked to efforts to set up an international tribunal into the killing in 2005 of former Lebanese Prime Minister Rafik Hariri. Syria denies involvement in the assassination, but its critics suspect it is trying to destabilise Lebanon in order to block the creation of the tribunal. In the murky, complex world of Lebanese politics, Syrian manipulation of Fatah al-Islam cannot be ruled out. But equally plausible - and no less worrying from a Lebanese point of view - is that the group is following a radical Islamist, rather than a Syrian, agenda. 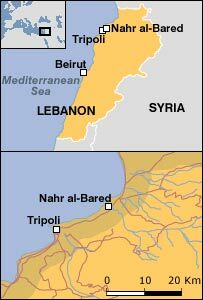 Over recent years, Palestinian refugee camps in Lebanon have been infiltrated by small groups of the al-Qaeda type. 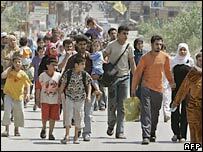 This has eroded the authority of the main Palestinian faction Fatah, which has traditionally run the camps and acted as a bridge between the refugees and the Lebanese authorities. 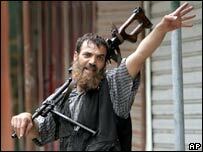 The militant groups, though small, are well funded and highly motivated. They reject the old-style nationalism of Fatah and identify with the new global jihad of al-Qaeda. They have ties to radical networks inside and outside the Middle East. The leader of Fatah al-Islam, Shaker al-Abssi, had reported links with Abu Musab Zarqawi, who led al-Qaeda in Iraq until he was killed last year. Another member of the group seems to have been involved in attempted train bombings in Germany last year. The implications for Lebanon are grim. It may have joined the list of failed or failing states which provide ideal terrain for the new global jihadists.